Sy Harding developed the best risk-adjusted investment strategy for index fund investing. His Street Smart Report newsletter was award winning, providing exceptional timing signals for over 15 years for stocks, bonds, and gold. Another retiring newsletter writer surveyed the field and recommended him to his clients - I was already a subscriber and a believer. Sy Harding’s strategy advanced the "Sell-in-May" concept - also called the Halloween Indicator - to a higher level. His research led to the conclusion that there are better dates for seasonal timing than simply investing at the turn of month in May and November. He exploited the fact that the favorable and unfavorable seasons did not start and begin on the same day each year much like the seasons in weather. When I was researching easy-to-execute strategies that could be applied to retirement accounts, his seasonal timing strategy leaped to the front of the line and remained there. Mark Hulbert’s Financial Digest began tracking three seasonal strategies in mid-2002 – the basic Halloween Indicator, Sy Harding’s Seasonal Timing Strategy, and Jeffrey Hirsch’s attempt to beat the Halloween Indicator. 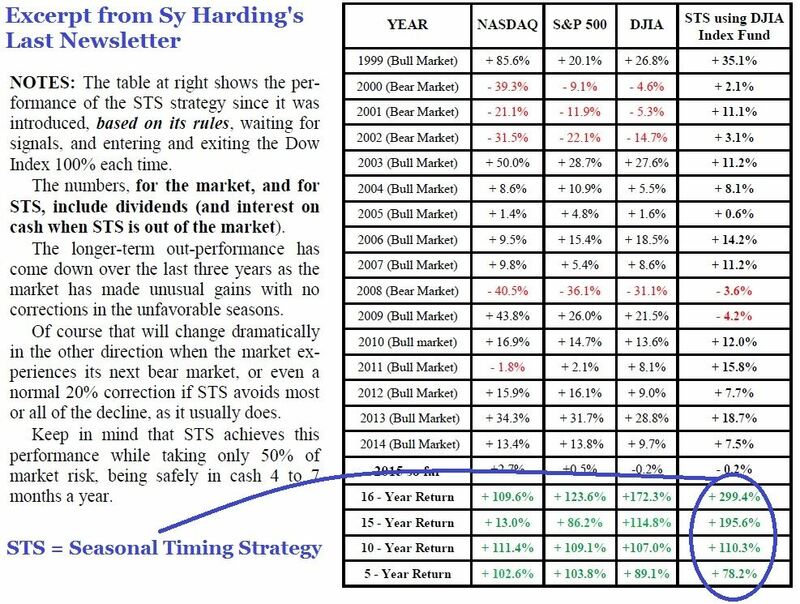 Only Sy Harding's strategy beat both the buy & hold and the basic Halloween Indicator (Sell in May). While the numbers do not look significant, Hulbert’s Financial Digest applies the timing signals to the Wilshire 5000 (total stock market) and not to the Dow Jones Industrial Index Sy Harding’s strategy is designed for. His calculations also sit in cash when not in equities understating Sy Harding’s total returns compared to the passive investor. I spent a lot of time studying both seasonal academia studies and Sy Harding’s strategy. In 2010, I began two efforts to gain first-hand experience with the market’s seasonal tendencies and how it could improve investing in the S&P 500 index. The first was to develop my own seasonal almanacs based on over 60 years of the S&P 500 daily prices. Unlike other almanacs, I focused on the trading day of the month and not a straight calendar day since the academic research pointed me in this direction. The second effort was to first replicate Sy Harding’s results as stated in his book. 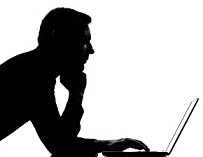 Once I developed a system that mimicked his results, I began to see if I could improve on it. The one thing that surprised me was that Sy Harding had simply used the default settings for the MACD indicator instead of optimizing it for the asset he was investing in – the DJIA. And it still blew away buy and hold investing. I was able to improve upon it, but my strategy stands on the shoulders of his work. I developed optimized signals for the total US Stock Market, the S&P 500 index, mid & small cap funds, and small cap funds based on the Russell 2000 index. What I have found is the small cap indexes exhibit the largest seasonal tendencies which makes sense. I was surprised to find the large cap DJIA came in second. 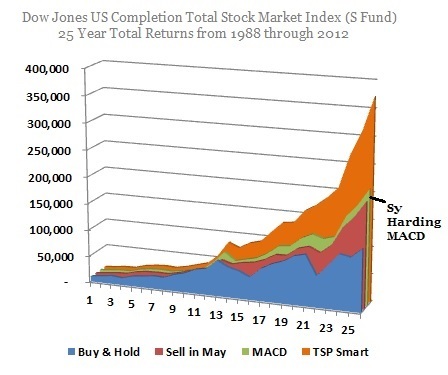 I am sure this is why Sy Harding invested his strategy in the DJIA over the S&P 500 index. As Sy pointed out, seasonal strategies are not designed to beat the indexes every year, but over the full market cycle they significantly outperform without adjusting for risk. Adjusting for risk, they simply blow buy and hold away. Like many investors who discovered Sy Harding, I am indebted to his work and education. I stopped subscribing to him a while back after developing my own resources. 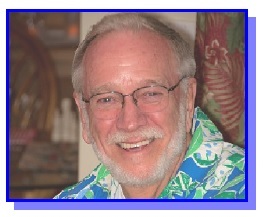 At one point I went to visit his website and was shocked to discover he unexpectedly passed away many months ago. He was a good writer and honest about his own mistakes. I still recommend his 2007 book, “Beat the Market the Easy Way” since it is eye opening and continues to be validated in the real-world of investing. I decided to start tracking his strategies results with my own. I can’t let the " best risk-adjusted strategy” disappear. I also send out his timing signals with my most basic service which is far cheaper than his $275 annual subscription fee. My strategy built off of Sy's work. I first duplicated his results in testing and then did some additional research to optimize the strategy for the SP500 index and also small cap index funds. When I applied Sy Harding's strategy to this small cap fund, I found it beat buy and hold significantly, but only marginally beat Sell-in-May. When I optimized the seasonal strategy for the small cap index, it significantly beat Sy and Sell-in-May. I have been sending signals since 2012 and I am professionally tracked. You can learn about us and our levels of service if you are interested in following the best strategy for index investing.